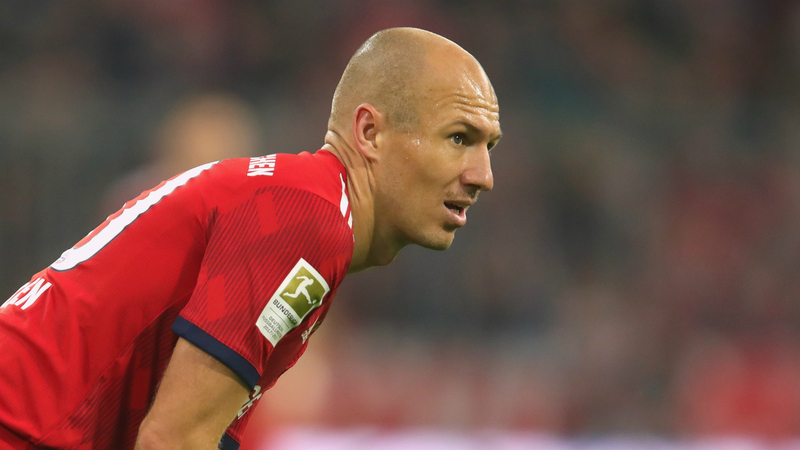 Arjen Robben is a doubt for Der Klassiker due to a knee injury, but Bayern Munich head coach Niko Kovac hopes the winger is passed fit to face Borussia Dortmund. Bundesliga leaders Dortmund welcome Bayern to Signal Iduna Park on Saturday with a four-point cushion to their rivals, Lucien Favre's men having won five of their past six league games. Kovac's men are also on an improved run of form, with seven points taken from the last nine available, but the former Eintracht Frankfurt coach feels Bayern are underdogs for the clash. And he could be without Robben as the 34-year-old, who has scored three Bundesliga goals this season, is short of full fitness. "Everyone is fine," Kovac told a news conference on Friday ahead of his first Klassiker as Bayern boss. "Arjen tried to train yesterday but has a couple of knee problems so we'll have to see how he trains today." Last weekend saw Lisa Muller, wife of Bayern star Thomas, criticise Kovac on social media for leaving her husband on the bench for 70 minutes of a draw against Freiburg. And despite Robben potentially missing out, Kovac says some players should expect more frustration when he announces his team to face Dortmund. "It's the Klassiker and everyone wants to play," Kovac added. "Everyone wants to play every Bundesliga game but tomorrow [Saturday] even more so. "I think people will be even more disappointed if they don't play but everyone has to work hard to make a positive atmosphere. "I always try with my coaches to pick a team to win the game, that's always the case and always will be the case. I don't pick players because I like or dislike them. "Some would have thought I wouldn't have picked Thomas Muller [against AEK Athens in the Champions League] but it's not the case. I look at the training and the opponent, it's nothing to do with liking or disliking players. I like all my players." Dortmund will remain at least a point ahead of Bayern regardless of Saturday's result and Kovac indicated he would settle for a draw against Favre's in-form side. "You [the media] say we haven't faced a team like Dortmund yet, but they haven't played a team like Bayern either," Kovac said. "In my opinion, the teams we played in the Champions League are very good teams. "I'd like to remind you, as I do all the time, Ajax are a good team. Germany lost to Netherlands recently, you don't have to talk down the other teams. We'll have to see what the outcome is. "I assume we are going to not lose and play well and get a point or more. Seven points [behind Dortmund] would be a lot; one point would not be a lot."